Etsy has long been a favourite hunting ground for little craft pieces, unique jewellery and art, so I was delighted to discover a similar site, Dawanda, another treasure trove of handmade goodies. Dawanda is a German based site and it can be viewed in German, French or English. 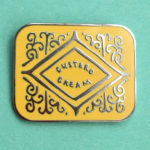 A cursory browse today brought up this lovely Retro Patterned Baby’s Bib. The description for this product is unfortunately in German (unfortunate for me that is as my German is beyond rusty), but there probably isn’t much that can be said about it. 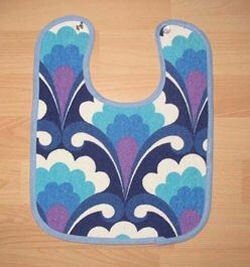 It is a baby’s bib, made out of vintage 1970s fabric and it costs 11.50 Euros (approximately £8.50). To buy one visit the Kaku Unicum store on Dawanda. 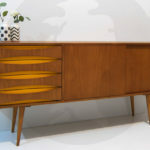 If designing your retro sofa with the Art Deco Fabrics we featured recently seems like too much effort, there’s someone who can create one and deliver it to your door – Scandecor. The company makes period sofas and chairs to your requirements and to order, with a range of designs covering Art Deco, 20s and 30s classics, along with 50s and 60s sofas – and all with your choice of material. My favourite is the Normandie from the Art Deco range, based on the designs used for the famous 1930s high-specification French liner, the S.S. Normandie – and very much shouting that period in time. 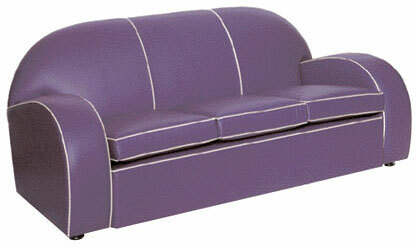 The Normandie is priced from £715, check the website for the full range of sofas and pricing. And thanks to Stewart for the tip-off! It’s so nice to be appreciated. 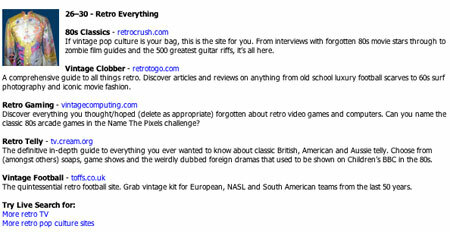 Our latest mention is from MSN, which believes Retro To Go is one of the top 30 sites for wasting a bit of time. Of course, as you’re here wasting some of your time, you already know that. 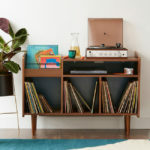 It’s just nice to know that all our efforts scouring the web for cool retro items isn’t in vain. There’s plenty of places out there with vintage sunglasses, but less with "normal" period frames. But if you look, they are some sites, including Retrospecs. Retrospecs has a range of old glasses from designer eyewear (including Christian Dior, Givenchy, Aviator and Yves Saint Laurent) to brand-free and NHS glasses. The pair featured above are without a designer label, but are vintage frames from the 1950s – and if you’re looking for that 50s look, they’re a bargain at £47. If these aren’t your thing, check out the site, there’s an endless selection of styles available. If you’re looking for something to read this weekend, might be worth having a look at Vogue’s 90th anniversary issue, which has a great cover featuring the pick of all the previous covers for the past 90 years. Or if you can’t be bothered spending your cash, check out the Vogue website for an online feature of Vogue’s finest covers. The website has thumbnails of 90 landmark covers, click on your favourite to see a large-sized image of that cover, along with details of the issue – who edited who, who photographed the cover and who starred on it. There’s also details of what was in that particular cover. 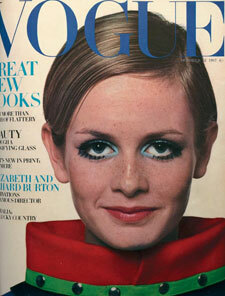 The one pictured here is (obviously) Twiggy from October 1967, photographed by Ronald Treager. If only all magazine websites were this interesting. 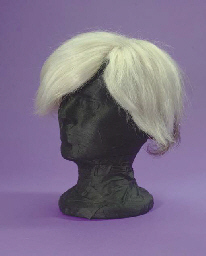 No, it’s no joke, at the forthcoming entertainment memorabilia auction in New York, a large Warhol collection up for grabs includes Andy Warhol’s wig – shown here and dated from around 1980. This trademark silver and dark grey rug with three strips of toupée tape was one of his more elaborate creations – originally he used wigs to cover up his baldness, but by this time, they’d become more of a fashion accessory. If you want to keep your head warm with a Warhol creation, you’ll have to bid between 4,000 and 6,000 U.S. dollars. 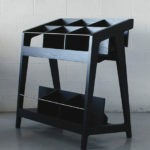 If you want something cheaper, there’s lots of other Warhol items, plus many other pieces of entertainment memorabilia. The auction takes place on June 22nd in New York.